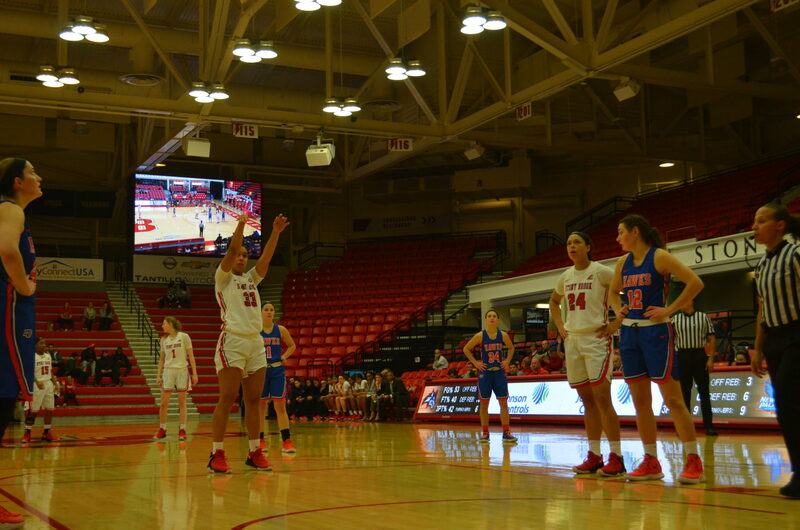 Stony Brook Women’s Basketball hosted the Division III New Paltz Hawks on Wednesday, Nov. 28, three days after defeating Big Ten Conference foe Penn State. Despite facing a more amateur opponent, head coach Caroline McCombs was determined to see the Seawolves withhold the same mindset. Stony Brook responded by delivering an offensive onslaught with an 87-50 victory over New Paltz. The Seawolves successfully focused their attacking strategy on commanding the paint. The team earned 46 points inside and looked to their forwards for scoring, something McCombs has been interested in integrating this season. Pagan overpowered New Paltz defenders by domineering her way to 10 quick points inside the paint in the first half. Pagan led the team with a career-high 18 points along with eight rebounds. Gouchie-Provencher also shined on the court and boosted up the Seawolves in the first two quarters. She connected on all five of her shots in the first half, including two three-pointers. She finished with a career-high 14 points and five rebounds. Gouchie-Provencher and Pagan started off the game by scoring the first 11 points for Stony Brook. Senior guards Jerell Matthews and Shania ‘Shorty’ Johnson combined for three three-point shots to put the Seawolves up midway through the first at 25-11. Junior forward Kina Smith’s last-second layup handed the team an 18 point advantage closing out the first quarter. Stony Brook continued to dictate the tempo of the game on both sides of the court in the second quarter. The Seawolves outscored the Hawks 23-7 and earned six more rebounds. Johnson capped off the quarter by converting a buzzer beater three-point shot from slightly in front of the midcourt logo, giving them a 54-20 lead at halftime. Johnson, who tallied 10 points and 10 assists in the first half, finished with 17 points and set both a new team and America East record with 15 assists. She currently leads the NCAA with 59 assists. While Johnson has made setting records look easy, the America East Player of the Week’s sole objective remains finding the best way to get the team to score. Pagan, Gouchie-Provencher, Matthews and Johnson each scored over 13 points in the victory. Nine different players recorded a point for the fourth time this season. Stony Brook will look to extend its winning streak to six games when they host the Cornell Big Red on Saturday, Dec. 1 at 1 p.m. The Seawolves will be looking for retribution after their 48-40 loss to the Big Red which snapped a five-game win streak exactly one year ago. Gouchie-Provencher believes the team will need to control the tempo in order to earn the victory.